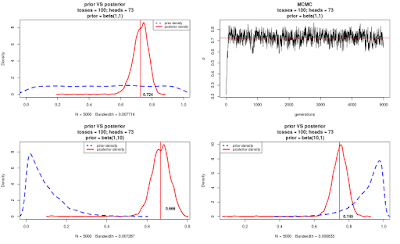 long time ago...: Understanding Bayesian Inference with a simple example in R! Last summer, the Royal Botanical Garden (Madrid, Spain) hosted the first edition of MadPhylo, a workshop about Bayesian Inference in phylogeny using RevBayes. It was a pleasure for me to be part of the organization staff with John Huelsenbeck, Brian Moore, Sebastian Hoena, Mike May, Isabel Sanmartin and Tamara Villaverde. Next edition of Madphylo will be held June 10, 2019 to June 19, 2019at the Real Jardín Botánico de Madrid. If you are interested in Bayesian Inference and phylogeny just can't miss it! You'll learn the RevBayes language, a programming language to perform phylogeny (and other) analyses under a Bayesian framework! Apply here! where Pr(h|p) is the likelihood of the data given a value of p, Pr(p) is the prior probability for p and Pr(h) is the marginal likelihood for the data. The prior probability of our parameter represent our believe about what values can take the parameter. If we think our parameter can take whatever value with the same probability, we use an uniform (flat) prior. - Step 1) Set an initial value for p.
- Step 2) Propose a new value of p, called p'. - Step 3) Compute the acceptance probability of this new value for the parameter. 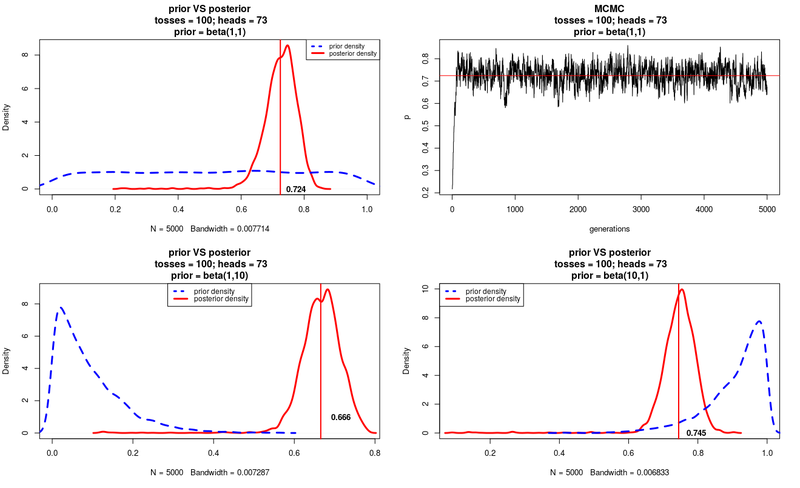 We have to check if the new value improves the posterior probability given our data. This can be seen as the ratio: Pr(p'|h) / Pr(p|h). - Step 4) Next, we generate a uniform random number between 0 and 1. If this number is < R, we will accept the new value for p (p') and we update the value of p = p'. If not, the change is rejected. - Step 5) Now we record the current value of p.
Finally, we should repeat this loop many times to obtain a good estimate of p. This can be easily done in R using a For loop (check the full code below). # Set the number of heads obtained. # Define our likelihood function. # Create an empty data.frame to store the accepted p values for each iteration. # Set the lenght of the loop (Marcov Chain, number of iterations).